X-Small - 110- 190 grams fits Quakers, Senegal, Doves,Med. Parakeets (Indian ringneck, Port Lincoln) Rainbow Lories, Rosellas, Noble Macaw, Lg. Conures (Suns, Jendays, Nanday, Blue Crown), Caiques. Let your bird safely enjoy the benefits of outdoor flight. 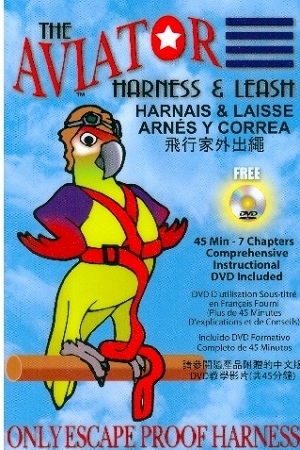 Unique, one-piece flight harness and attached elastic cord leash offers your bird safe, escape-proof flight. Unlike most flight suits and harnesses that feature multiple buckles and clips, the Aviator's single plastic buckle design helps prevent injury to your bird during use. Plus, it is easy to install - simply slide the harness over your bird's head, gently pull his wings through the harness body, and pull the lead to tighten the belt to your bird's mid-section. Harness is made of supple nylon for added comfort and fewer pressure points when compared to other flight harnesses. Elastic, bungee-cord-style lead helps prevent injury if your bird flies to the end of the leash. Features a wrist-loop for convenient, drop-free use. Includes a DVD instruction video loaded with helpful training and use instructions. 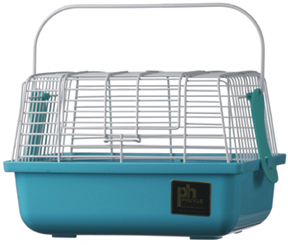 Carrier Cage - Small - 9" x 5 5/8" x 6 1/8"